Drontal Cat worming tablets contain 20mg praziquantel and 230mg pyrantel embonate for the treatment of every type of intestinal worm commonly found in UK cats. Drontal Cat is effective against Toxocara cati, Toxascaris Leonina, Dipylidium caninum & Taenia taeniaeformis. 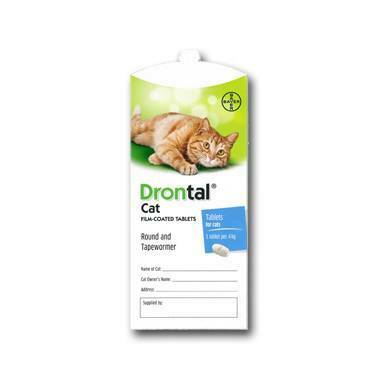 Drontal Cat dosage: recommended dose rates are 57.5 mg/kg pyrantel embonate and 5 mg/kg praziquantel. This is equivalent to one Drontal Cat tablet per 4 kg bodyweight. For single oral administration; the tablet should be given directly to your cat or if necessary can be placed in food or `easy tab` tablet pocket. Dose every three to four months.